I have only been seriously blogging since this past April. Although, I started my blog in August of 2012. After school started in the fall, I found it difficult to keep up with my blogging and didn't really have anyone to take photographs for me regularly. But this past semester, I realized how much I loved and missed blogging, so I began again. It is definitely like a part time job- if not full time! I started my blog for so many reasons. First, I wanted to have a place of my own, where I could share and record the things that I love. My specific interests are fashion, design, and travel. I am an interior design major, and am working on incorporating that more in to my blog. Secondly, I wanted to make connections with people that appreciate the same things I do. When I started my blog, I was opened up to a whole new network of people that I could relate to. Finally, I hoped that if I started my own blog, I could inspire someone, just as I was inspired. As far as blogging, I was inspired by the well-known blogger Rachel from Pink Peonies. I followed her for months before deciding that I wanted to start my own blog. It amazed me that someone could turn what they loved to do into a living for themselves. She continues to be my biggest blogging inspiration today. In my spare time I love to go to the beach. Whether it is on my own with a good book, or with a giant group of friends with a volleyball net and some good music, I always have an amazing time. My favorite beach to go to for relaxing in San Diego would have to be Coronado, but if I want fun things to do and an exciting atmosphere, you can find me at Mission or Pacific Beach. I have lived in San Diego my entire life, however, moved away to Long Beach for college 4 years ago. Although, you can find me in San Diego pretty much every weekend. Living in Long Beach really opened my eyes to how much I appreciate San Diego. Don't get me wrong, I love Long Beach and the two are actually pretty similar, but you just can't compare to San Diego. There is always something to do and the weather is phenomenal. Your options are endless as far as things to do during the day and nighttime. Some of my favorites include: strolling through seaport village, Belmont Park on a hot summer day, the Wavehouse in Mission beach on Sundays, Seaworld (duh), Lolitas for great Mexican food, Hodad's for a burger you wouldn't believe, Sushi Deli for mouthwatering sushi, hiking to Potato Chip Rock, a good movie at Cinepolis, Double Deuces downtown, Beachwood in Pacific Beach, and the list could go on and on. The first piece of advice I would give is to be true to yourself in blogging about what you love. The second, and equally important, piece of advice I would give is to only follow blogs that you love. Both of these will keep your blog authentic. Too many new bloggers out there are worried about how many followers they have, and are willing to follow anyone just to gain an extra follower. Be true to yourself in following people that truly inspire you, and then you can be assured that the people following you are doing so because you inspire them. Amanda is one of my best friends and I cannot express enough how amazing and inspirational she is! She is one of the reasons/inspirations for starting my blog and is an all around amazing woman! Awesome!! 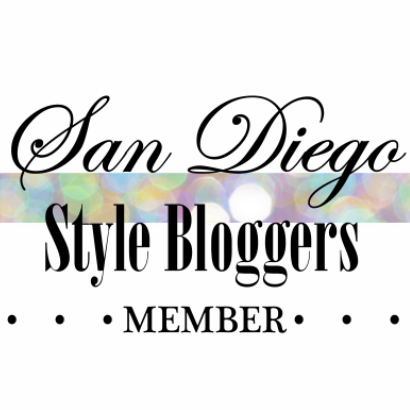 So nice to meet a new SD Style Blogger! I love Pink Peonies too, so cool. Totally loving your style (I actually have that Target dress too!) great minds think alike ;) Hope to see you at one of our events Amanda!